I've been at this since 1969. 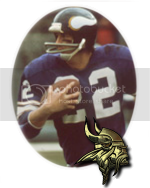 I would say the 1969 team that played in Super Bowl IV was the most heavily favored Vikings team to appear in a Super Bowl, and one of the most talented compared to its opponents. Obviously things didn't turn out that well, but to this day, I believe if the Vikings and Chiefs had played 10 times, the Vikings would have won 8 of them. That defense ... never a better one, in my opinion. Steel Curtain. Ravens. Broncos. None of them better than the PPEs of '69. I suppose that's why they were so heavily favored. It's safe to say that the oddsmakers didn't think much of the AFL in those days, as they had made the Colts THE most heavily favored team in a Super Bowl (before or since) just one year earlier against Joe Namath's Jets. Apparently they didn't learn from that game. It sucked in 1973. We were really, really good that year, with another absolutely dominant defense. So when Larry Czonka and Jim Kiick ran over us in the Super Bowl, I was stunned. Never more frustrated watching another team's offense against our defense. I just kept wondering, "Why can't we stop these guys?" The next year, we simply didn't stand a chance against Pittsburgh. I don't know what it was, but we didn't match up very well against that defense. The Steel Curtain did to us what we SHOULD have done to the Chiefs. Again, frustration, this time at the offense. "Why can't we get a freaking first down?" In 1976, that was simply devastating. The single most devastating day of my life. We were still really good, especially offensively, but our defense was aging. I knew if we didn't win that game, we might not win another one for a long time. I had no idea it would be 40 years and counting. Winning this year would exorcise a lot of demons for me personally. A lot of bad stuff happened to me following the loss to the Raiders. I feel eerily confident this year. Mike Zimmer is the reason. I think when all is said and done, we might be talking about him the way we talk about Bud Grant. I love the guy and the way he coaches. I think he's completely changed the culture of the Vikings. Brad Childress said he was going to clean up the team, but he just ended up being a big talker who didn't lay it on the line for his players. Mike Zimmer's players would run through hell for him, mainly because they know he'd do anything for them. Jeez, with 8 eye surgeries, I'd say he already has. This team is so accountable, so together, so sacrificial. They simply want to win. They don't care about individual accolades, unless it's one Viking lobbying for another, the way Xavier Rhodes is campaigning for Harrison Smith. That kind of unselfish attitude from extremely talented players gives me a great deal of hope. New hope? Yeah. No doubt. There's something different about this team, different than any Vikings squad I've seen in a long, long time. They may not win it all, but even if they don't, I fully believe they'll be right back in a similar position next year. Mike Zimmer is building something special here. J. Kapp 11 wrote: I've been at this since 1969. Yeah, I was 11 when the Vikes got beat by the Raiders, and my brother, 15, was a Raiders fan......it was brutal. One thing I’m not reading is how well this team adjusts within the game. I think that is one of the biggest and best things that Zimmer does. It gives me confidence that we can beat the Pats. I know Belechick is a genius but I think Zim can match up and they can keep the Pats to under 20 points. My big concern is Keenum scoring enough to beat the Pats defense. This is one of the biggest differences from this team from the last decade. It seemed like Childress and Frazier always got beat in the second half schematically, which almost never happens under Zim. mosscarter wrote: I'm going to have to disagree with the fact that this year's team is better than the 2009 or 1998 teams (I hope they prove me wrong). In 98, we lost two games all year by a combined 6 points. It was the best offense (maybe other than when Moss was with Brady) ever. The truth is that team didn't need a defense, all they needed was to make a field goal when it mattered. I know I always fight an uphill battle when I try make this point - I have several times over the years - but we needed a defesne. When Anderson missed his field goal we still were up by a touchdown and only needed to keep Atlanta from scoring a touchdown to make sure we went to the Super Bowl. Anderson's 1st miss came at the worst possible time, but if you were to say you needed a strong defense or a perfect kicker to be successful, which one seems more attainable? Regardless, I have to go with the thought that this squad is the more complete team, although I agree that the 98 squad was obviously our best offensive squad ever.